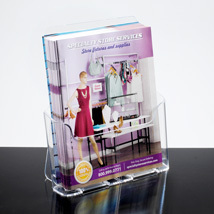 Full face upscale brochure display keeps your literature neater and more organized. Place on table or counter but also mounts on walls. Inside pocket width 1 1/2 in. deep. Crystal clear display of 8 1/2"W x 11"H media.